The J. Warren Perry and Charles Donald Perry Memorial Fund is one of more than 850 funds at the Community Foundation for Greater Buffalo established by individuals, families, nonprofit organizations and businesses to benefit Western New York. 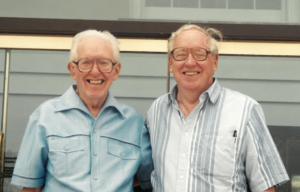 The Perry brothers established their fund to support a unique annual competitive process that awards grants focusing on innovation and sustainability. Only specific organizations noted by the Perry brothers are invited to apply. Please read the eligibility requirements below. Applications MUST be submitted electronically online. No paper applications will be accepted. Outcome reporting will also be online when closing the grant. The Perry brothers established their fund to support a unique annual competitive process that awards grants focusing on innovation and sustainability. Organizations not listed above are not eligible for grants from the Perry Fund. For more information, please contact Darren Penoyer by email at darrenp@cfgb.org or at (716) 852-2857 ext. 206.